The STP co-ordinator will organise the development and implementation of the travel plan. At a strategic level they will be responsible for pulling together all of the information, looking at and understanding the bigger picture to see what needs to be done and the best way to do things. They will disseminate information to the working group to ensure everyone is kept up to date with what is going on. They can be any member of the school community – parent, governor, teacher, member of staff. The meetings are held at venues across the County in the Autumn and Spring terms. They are open to representatives from all schools in Bucks who are interested in all aspects of school travel planning. It is a great opportunity to meet other Co-ordinators and find out what is happening in the world of school travel. 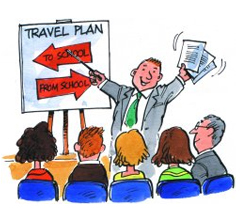 We organise an Annual School Travel Conference in the summer term, to help Co-ordinators develop, implement and maintain their School Travel Plan. We give practical advice and guidance, give examples of how other schools have developed their travel plans and initiatives, and offer some useful ideas that have really helped to maintain and sustain them. We encourage STP Co-ordinators to communicate with other Co-ordinators to share ideas and good practise. Our Newsletters are an ideal way to promote events and campaigns.